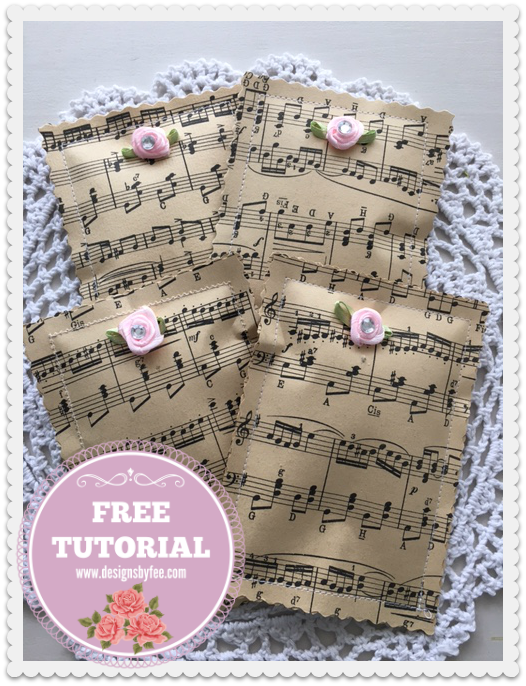 Over the past few months I have been making some little items for gifts. Luckily I took photographs as I went (it's become a real habit since beginning blogging 8 years ago) So I already have lots to share with you and a big long list of items yet to be made. Here is a little taster of what's to come. The photograph above is of some little post it note packs. They are so handy and practical. They could be made for men with a masculine theme such a fishing or golf. Shabby flower brooches or embellishments made from recycled textiles. Keep your eye out on the $1 rack at your local opportunity shop. 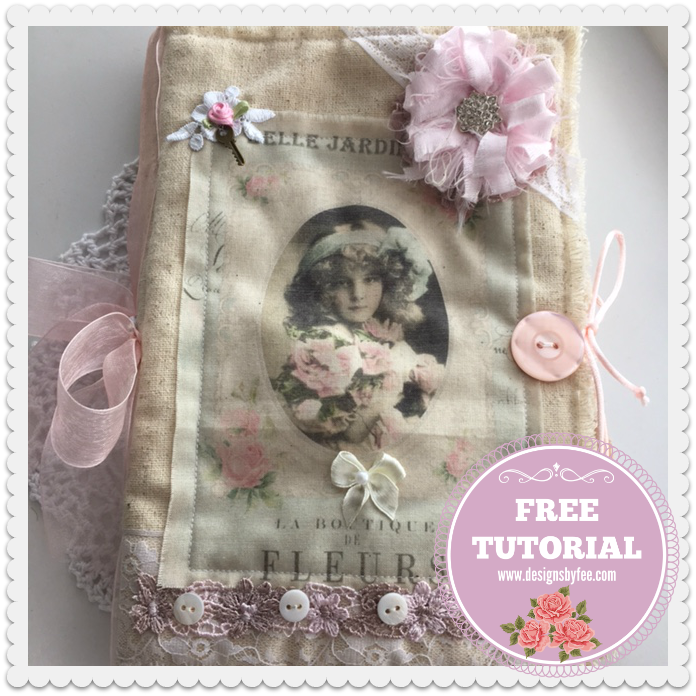 One of my favourite recent makes is this fabric keepsake memory book. 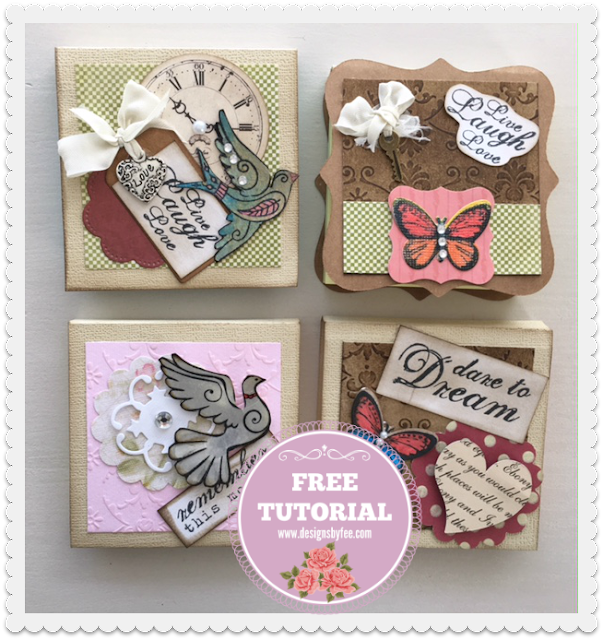 I just love it and can't wait to show you just how easy it is. Sweet little tissue holder packs made from scrap fabric and trim. These would be great for work mate gifts or as a stocking filler. 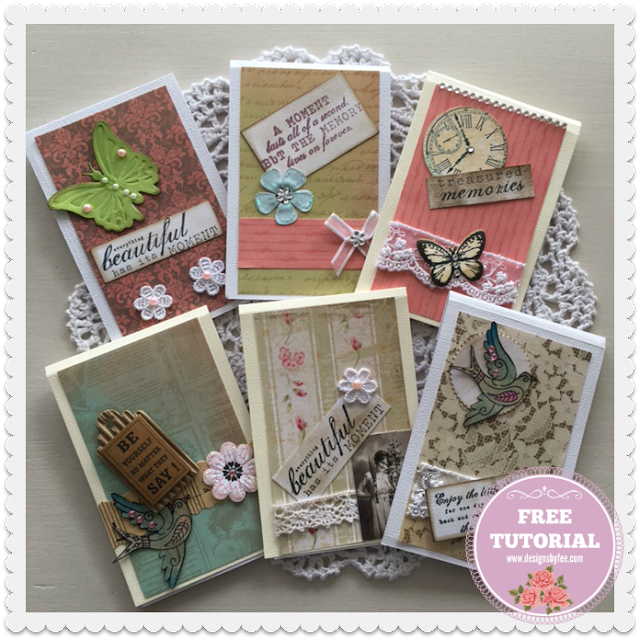 Gorgeous little note books that would fit inside a card to be sent in the mail. Just a nice touch and a thoughtful useful gift. 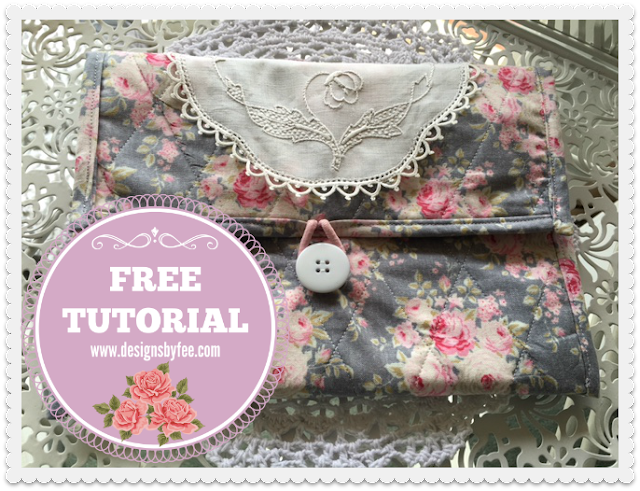 My Zippy Pouch Tutorial is another one of my favourites. 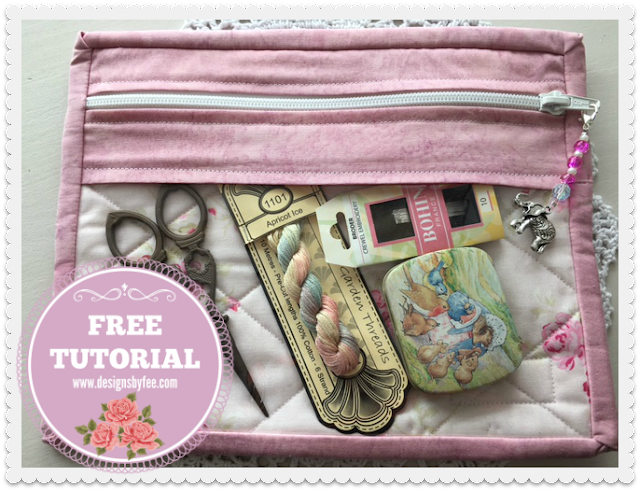 If you are afraid of zips then my easy tutorial will be wonderful for you. You will fear them no more ! 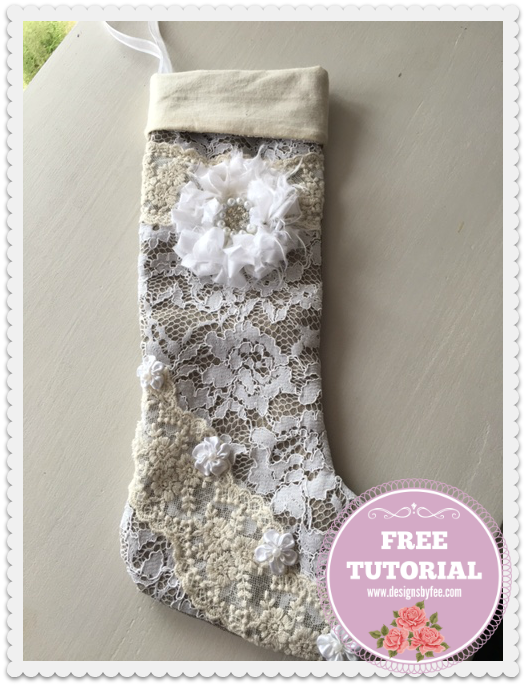 Super easy shabby christmas stocking made from lace from clothing and linen/calico and adorned with a handmade shabby flower. I love these ! 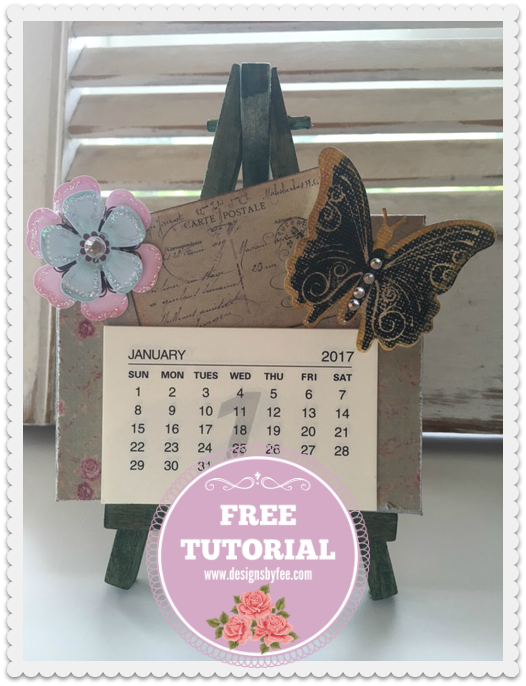 My second calendar tutorial. This one mounted on an art easel for an office desk. I will also show you some different techniques to colour stamped or printed pictures. They are so effective and allow you to make your very own embellishments for cards and paper projects without having to go to the expense of buying expensive pre-made ones. 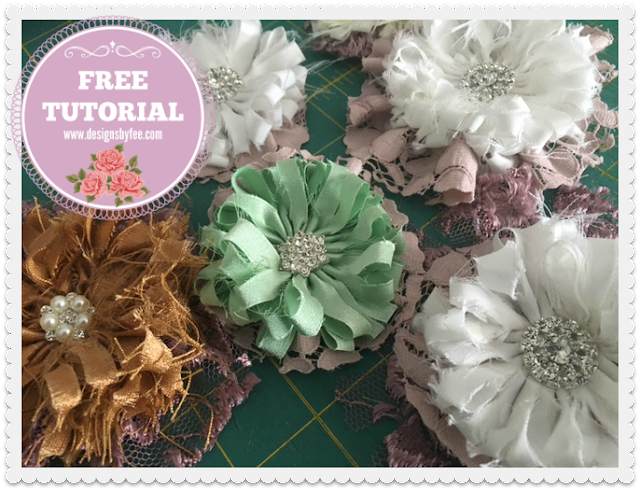 Then I will show you some easy tricks to making them look fantastic and ready to be mounted on your project. I've also got a quick and easy tutorial for making your very own gift bags. 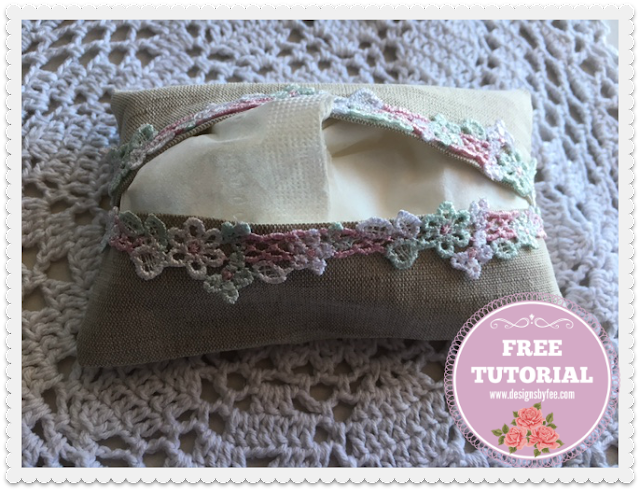 And this beautiful fabric bag using a recycled doily. It could be used for so many things, Jewellery, Make Up, Ipad ...... The list is endless. So as you can see that not being able to do very much physically has led to an over abundance of time and thinking. 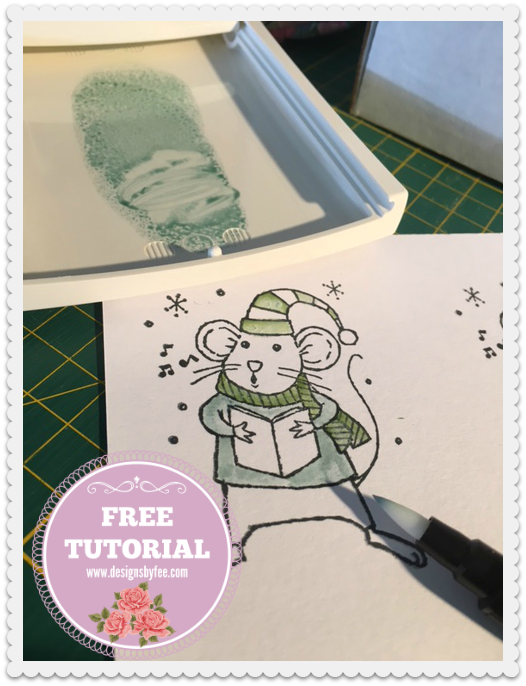 As I said yesterday it was really important to me to have lots to go on with at the beginning and then I can quietly work on some new ones whilst you are all busy making your favourite ones from some of the tutorials coming your way in the next few weeks. Can I ask a favour of you though ? 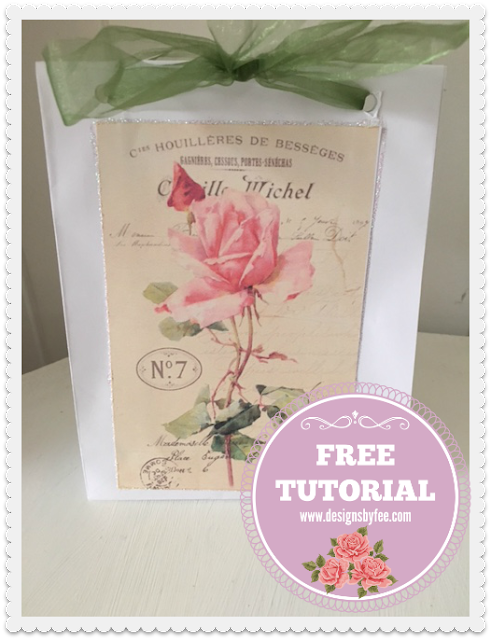 Would you mind very much placing this logo on your side bar, linking it to my blog and sharing about the upcoming tutorials on your own blog ? Simply right click on the logo, Choose Save Image As and then save to your computer. It would be great if we could reach as many people as possible. The first tutorial will be the magnetic calendar and I will release it on Friday. There are no hoops to jump through or no payment required just share with as many people as you can - That's all I ask. Great posts . Looking forward to more. Thanks. OOhh that is sooo exciting Fee ... some of your tutorials make me swoon. 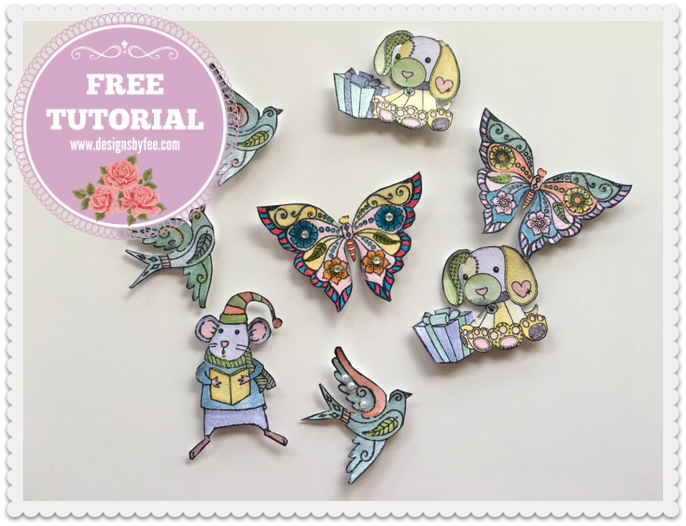 I have just managed to add your logo to my blog & I have even managed to make it "clickable" to connect folk to your blog. Honestly if you knew my computer skills ... you would be so surprised at this !!!! Thanks Fee, I always enjoy your blog and many of my stash treasures come from the online shop you ran. All the best for your health- we are there with you. And so looking forward to the tutorials- my kind of gifts! Wow so many beautiful projects can't wait thank you so much Fee. Wow, yes, I absolutely will put it on my sidebar, and I'll also post about it on QuiltBOM, too. You'll get a ping from that post. You have such good ideas! I'm sorry you are confined, but you've certainly used the time well!